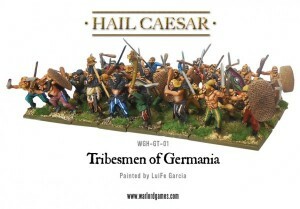 Warlord Games brings you a new box set of infantry for Hail Caesar with their Tribesmen of Germania. Which is right next to Anvilania, I believe. Bursting out of the Teutoberg Forest and onto the shelves is our latest boxed set for our Hail Caesar range – Tribesmen of Germania! Clad in furs and wielding wicked clubs, cruel spears, and looted Roman gear, the Tribesmen gave the Legions of Rome a bloody nose on more than one occasion.